AudioRealism is a new company based in Uppsala, Sweden and they released their 'Bass Line Synthesizer' (or 'ABL' as it's commonly known) about a week ago ... We grovelled (heh) & got a copy asap!!... all I can say is..... BLOODY AMAZING!!!! I wrote a 303 emulator (Freebee) during my uni years and it was turning out pretty well. Later I switched computers and my hdd went dead, so I decided to release what I could access at that moment, and that was the Freebee executables. After graduation I decided to start my own company as I got a lot of feedback from people requesting a VSTi version of Freebee. So I started working on that, I got some government funding to sustain me until the company is bearing and here we are. ABL (AudioRealism Bass Line) turned out much better than I anticipated, much due to hard work and not letting any detail be too small to include in the emulation. I do make music myself, I'm mostly into jazz and funk and love to play my Fender Rhodes. I have participated on some albums, latest on a collection called the Golden Room vol. two on Minus Habens records. I used to be into electronica and acid house back in uni, and might start up with that again now that a managable plug-in exists. In recent years we've seen old classic synths brought back to life in s/ware form, starting with the likes of the PPG or the Pro-52... Then it was the DX series.. and now we've WASP's and MOOG's in s/w form and a whole slew of others... many will actualy load the presets of the original hardware units!.... 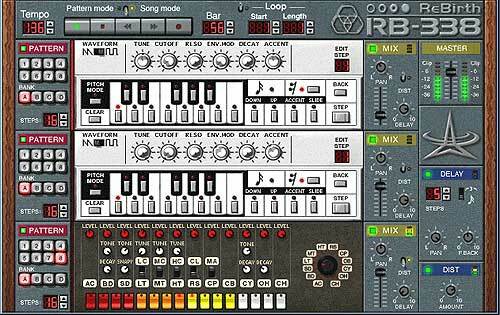 So, the release of this baby from AudioRealism is a natural progression .... it had to happen sooner or later... A 100% authentic Roland TB303 'Bassline' in s/w VST plugin form... That's what AudioRealism's 'Bass Line Synthesizer' gives you! It looks like a TB303 - It sounds like a TB303 - It programmes like a TB303... I'm in 7th heaven!..... Slide & Accent are so close it's spookey & although the 'Tie' function isn't there in the same way, you can use a couple of slides to get notes longer than the scale value. To all intents and purposes the ABL gets you pretty much exactly the same sequencer sound/feel as most people would use for making music with a real TB303... It's as authentic as you'd want!..... In fact... I feel like a few biscuits or preferably a nice tab listening to this when I close my eyes! If you own a TB303, or owned one long enuff to actualy use it and know how to programme one, then it's all there exactly as it should be... However, there's a few nifty touches when it comes to AudioRealism's implementation of this synth as a plugin working & clocked within a host sequencer... I might even get out me old TB303 manual out and scan it for upload to the site! The Bass Line Synthesizer has 128 pattern slots (0-127) which you can save (all in one go as far as I can tell) - and YES... It saves & loads in LOGIC using the standard 'Save Setting' dialog in the Logic host frame which surrounds Plugins!... Excellent!... Hey!... it also imports Rebirth RB-338 & Freebee VSTi patterns!! Glory be!... True to the original in every relevent way, you also get the infamous 'Last-Step' to allow layering 3-time over 4-time patterns for classic aceeeed madness! Blimey!... the only drawback I can see is that newbies will be be-fuddled by the authentic programming interface... However, it also has a switch to change from PATTERN MODE to NOTE MODE - in which case it responds to midi notes like any other synth, so you can even play old songs with it's amazing sound, although whether you can get that realistic 303 vibe without the actual sequencer working is doubtful, but still, for newbies and for resurrecting old tracks this is a welcome addition.... great stuff! Also... a small gripe, but only very small - I'd perhaps like to have seen a larger screen-area for the ABL.... Sure, on a smaller screen with less available screen-estate & working close-up it would save clutter & it's 100% visible when I tried it on another test-box running SX..... but I work on the main machine with dual screens running at 1024 x768 & sitting about 4 feet away - Sometimes it's a bit hard to see if your eyes are a bit tired or smokey!... As I say, it's just a small issue if I had to find one.... The AudioRealism website says there is to be some skins released soon for ABL & asks for feeback on this subject... so mebbe a black/charcoal skin with brighter white text & more brightly illuminated LED's would work for me better on my main system... Devilfish and a sprayjob then for me.... heh heh!! What more do you want for 95 euros!?... they could have charged ALOT more for this believe me, and still would sell shed-loads! - I reckon even at 95 euro's they'll make it rich with this baby..... Your dream... a 100% realistic TB303 as a plugin, with full-on control, authentic sequencer & sound, and pattern save/load!! I'm astounded!.... is that a classic-trance revival I see on the horizon!... Yeehaaaaaw!! Dancetech give the Bass Line Synthesizer a totaly resounding 10/10 !! - Best dance-music software synth of the year too for sure... probably of the decade! Don't believe the breathless hype. The basic sound is good, but it has a few downsides. - Squarewave sounds terrible, as on all software emulators (the 303 square is very special). Of course it's a square, but not the 303 square! Verdict: If you want a 303 for a low price, go for it. Nice basic sound, add some effects, and you'll probably end up with good stuff. Would be cool if the author would look at the above, and make a polyphonic synth outta it, that would truely rock! 90% like the real thing, but the 10% is what counts! After looking at this site and also the reviews it occurs to me the information is based on a very old version. You need version 1.5 to make a real comment on this ting. It does use CPU, but all the best things do!! The square wave that people have mentioned, is as far as i can see, 99% authentic so i wish poeple, who think they know about audio, would actually sit it down with real thing and see how fuc%^ing brilliant this thing is. 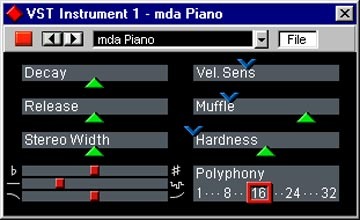 Dont forget to enable midi out if you want to use this to trigger other stuff, even external analogue stuff can be sequenced in Host like cubase sx etc. Respect to those that strive for the best sounds. Arrangement is just as important tho!! Good luck to all musicians.